Computex is a technology based event that happens in Taipei and it allows companies to show off all their latest and greatest technology that they offer. This year was an exciting year with venders doubling down on RGB everything and cranking out products for Intels new X299 and AMDs X399 platforms. But that’s not all, there was cases galore and all the usual shiny new peripherals to match. So lets see what MSI has to offer from this years event. First up is their high end X299 motherboards for Intels latest and greatest CPU line up. The first product on their roster is the Gaming M7 ACK. 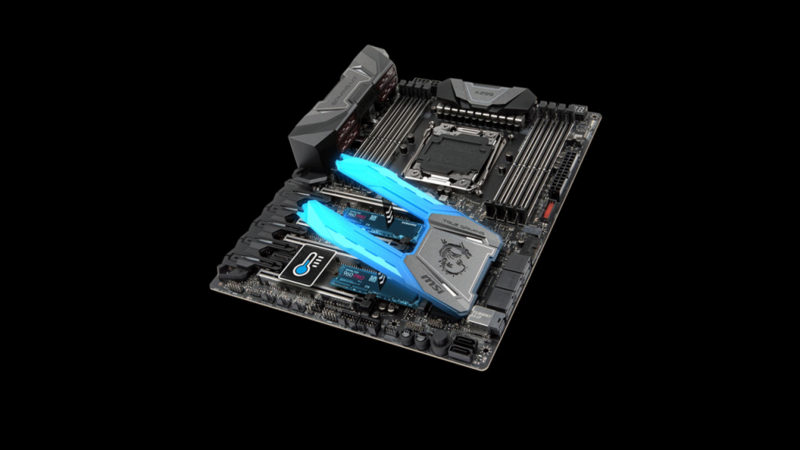 Announced as the ultimate gaming motherboard the M7 has some impressive new features. One of those is MSIs newly integrated FROZR M.2 thermal solution. This new solution is built into motherboards PCH heatsink and creates a more robust cooling solution, meaning it should keep any installed M.2 drives nice and cool. It also uses a revised version of MSIs Audio Boost 4 PRO which uses two dedicated audio processors each with their own dedicated amplifiers. This allows you to use a pair of headphones and speakers at the same time, whilst maintaining the great quality on offer. The M7 also uses a new version of their Ethernet connection. Called the Killer Double Shot PRO it lets you connect a E2500 Ethernet connection and a 1535 Wi-FI adapter to work together to provide a solid and stable connection. But that’s not all. The M7 ACK boasts Mystic Light RGB support with up to a dizzying 16.8 million colour choices and 17 different lighting effects, you can really go to town with the RGB. Or you can always switch off the RGB if you don’t like it. Also on the customisation front the motherboard also has support for 3D printed parts. 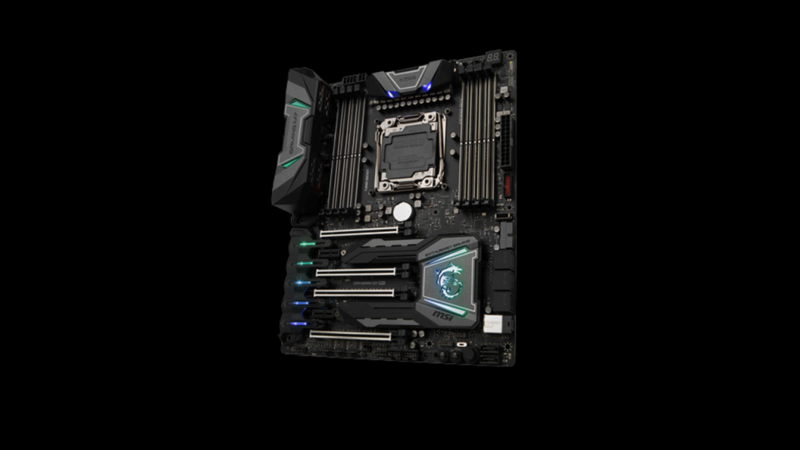 That means if you have access to a 3D printer you can create custom printed covers, SLI bridges and other accessories to create a unique motherboard. 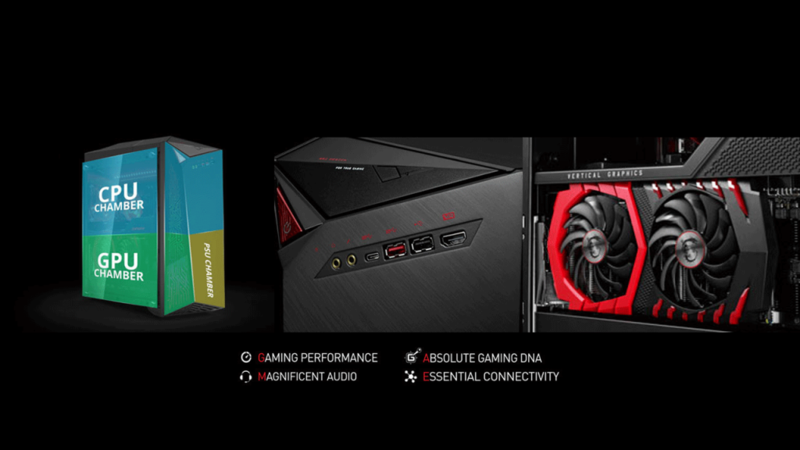 Onto the next piece of exciting news and that is the announcement of a new Gaming desktop. 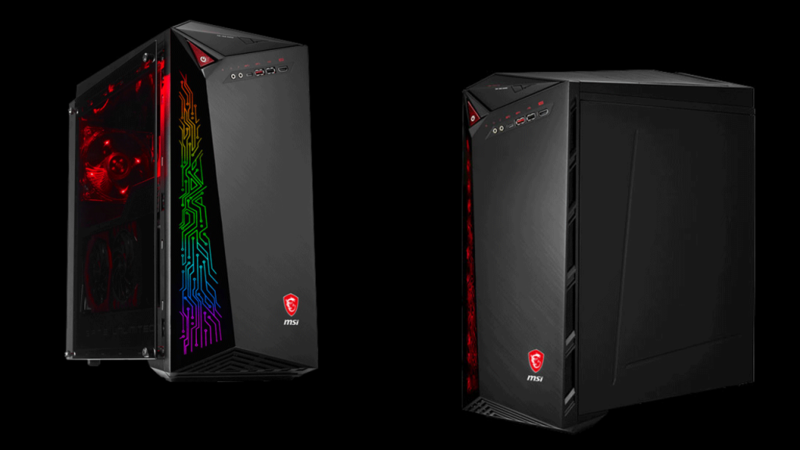 The Infinite series is MSIs latest and possibly greatest pre-built gaming desktop to date. The first things you notice is the striking design which either going to love or loathe. But its interesting nevertheless. The Infinite series features a new chassis design sloping angular components and aggressive edges its right on point for this years design trends. Speaking of design the Infinite series will have an interesting circuit styling on the front facia, this will be illuminated with RGB and of course you’ll be able to tweak the colours to your preference. Its also sporting a tempered glass side panel to show off all the components. Also cool about this model is the three chamber design. This allows each of the main components to be housed separately for improved thermals. Dubbed silent storm cooling 3, this system allows each of the main sections to be cooled, reducing temps and keeping noise to a minimum. But only time will tell if this pays off. The case also has support for VR meaning that you can run your Oculus or HTC Vive straight from the front of the PC. This just makes setting up even easier. It achieves this by implementing a HDMI port on the front IO. Also the offers your usual array of a mic, headphone port, as well as a USB Type C port and both a USB 3.0 and 2.0. Finally the Infinite A can house a full size GPU and it can be mounted vertically to show off the faceplate and fans. More details will be available when the products are released sometime this or next quarter.